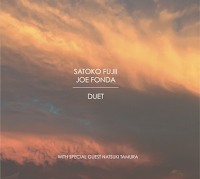 Japanese pianist-composer Satoko Fujii and American double bass master Joe Fonda did not need much time to establish a rare and profound musical rapport. These two prolific musicians managed to do so even though their winding paths have never previously crossed and both had not heard much of each other’s work before they were asked to play together. Duet, initiated by Fonda after a promoter in Germany recommended him to listen to Fujii, captures beautifully the duo second concert at Woodfords Congregational Church in Portland, Maine in November 2015. These resourceful and experienced improvisers tapped immediately into a rich, intimate musical atmosphere. Duet begins with an extended free-improvisation titled “Paul Bley”, obviously dedicated to the late pianist. Bley was an early mentor for Fujii, a student of him at the New England Conservatory in Boston, with whom she recorded a piano duet (Something About Water, Libra, 1996). Fonda plays with one of Bley’s early collaborators, drummer Barry Altschul in his 3Dom Factor trio. This piece is a powerful - in the most physical and muscular sense of the word - both Fujii and Fonda sound as if they play all over their instruments, very intense - even in the short, quiet segment that Fonda plays on the flute, with sudden, fast-shifting ecstatic moods. Both explore inventive timbres, extended bowing and percussive techniques, structure and deconstruct colorful textures, always pushing each other’s sonic envelope without stopping for a second to gain their breath. Their mutual understanding is so immediate that you may think that they actually developed a telepathic reading of each other’s minds, created a unique sonic entity that, no doubt, would have made Bley happy. The second, short improvisation, “JSN”, features also Fujii's partner, trumpeter Natsuki Tamura. This piece offers a different, more relaxed, even melodic atmosphere,informed by the inventive, playful ideas of Tamura. His idiosyncratic playing, together with fonda folksy flute and Fujii hammering on the piano strings contribute to the clever, mischievous spirit of this piece. This masterful, exciting duo calls for more, many more performances and recordings.